Shaken (車検), the mandatory vehicle safety and emissions test in Japan, was recently addressed in a series of posts on AccessJ comprising Dom's excellent self-shaken guide. 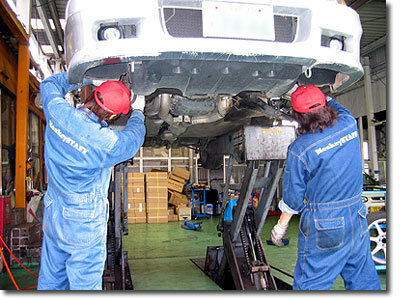 To keep your car on the road in Japan (as a non-commercial driver, that is), you'll have to have a shaken inspection done on it every 2 years, your own car's expiration date indicated by a square sticker top-and-center on the front windshield. ...But slip-ups happen, right? What if you forgot about your shaken until it was too late? Or what about cars in used-car lots? Surely the dealers aren't keeping all their cars up to date until they're sold? * A car is illegal to drive without shaken, but it's not illegal to own such a car, so there must be some way to get the shaken renewed, right?? Unless you're about to call in a tow-truck just to take your car to the local Autobacs, District Land Transport Bureau, or wherever you plan to have the shaken inspection performed, you'll need to drive your vehicle to that location. But remember, the first and biggest problem with a car whose shaken has expired is that it can't be legally driven anywhere (except on that private road you may happen to own that connects your house with the nearest mechanic's shop). 5) and about 750 yen. You'll be issued a temporary plate, which has a foreboding red slash through it and is valid from 3 to 5 days. This may seem like a lot of work, and I guess you could risk it and just drive the expired vehicle if the shop was just a few minutes away from your home, but the mechanic will probably raise his eyebrows... and could even refuse to provide service (especially for chain stores, policy may be in place to turn such customers away because of questions that could later arise in the shaken application process about how the vehicle got to the shop). The second big problem with expired vehicles is that they are usually not insured--the jibaiseki hoken usually runs out at the same time as the shaken. Also, you won't be able to get the temporary license plate without proof of compulsory insurance, called the 自賠責保険証明書 (jibaiseki hoken shoumeisho). 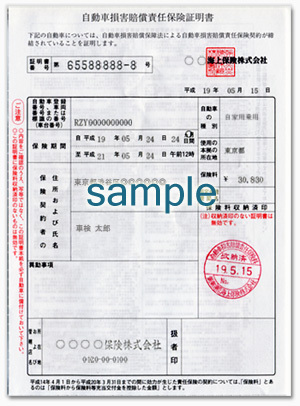 Compulsory insurance can be purchased in increments from just 5 days (about 5000 yen), meant for people obtaining a temporary license plate in order to drive the car to the dump or to sell and transport a car to someone else without first completing shaken, up to 25 months (price dependent on size of car, up to about 25,000 yen), which is what you want if you'll next be renewing the shaken on your car). You can obtain compulsory insurance through an auto insurance agent--the same people who handle optional insurance (任意保険). Once you've secured your temporary license plate, you're ready to drive to the garage where you'll have your shaken inspection handled--from here, it's the same process as a normal shaken renewal. For details on places, prices, and what'll occur during the actual inspection, check out AccessJ's shaken guide!